Project management and word processing tool for writers. Is there a better alternative to Scrivener (Windows)? Is Scrivener (Windows) really the best app in Word Processing category? Will Scrivener (Windows) work good on macOS 10.13.4? 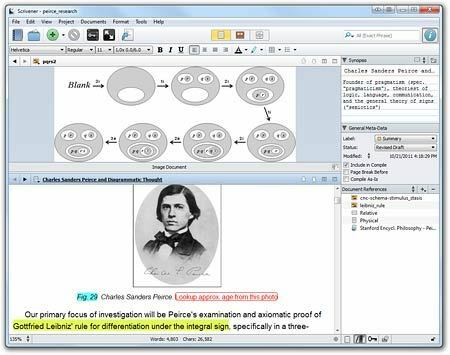 Scrivener is a project management and writing tool for writers of all kinds that stays with you from that first unformed idea all the way through to the first - or even final - draft. Outline and structure your ideas; take notes; storyboard your masterpiece using a powerful virtual corkboard; view research while you write; track themes using keywords; dynamically combine multiple scenes into a single text. Scrivener has already been enthusiastically adopted by best-selling novelists and novices alike. Scrivener's "project.scrivx" file (the file with the yellow Scrivener icon, used to open the project) now uses the project folder name rather than the generic "project". The UI has been updated slightly, including moving the inspector buttons to the top of the inspector. Multiple inspector comments and footnotes can be expanded and collapsed using the View > Outline commands or the Left/Right Arrow keys. The appearance of comments and footnotes within the text has also been slightly refined. Compile replacements now allow tabs and carriage returns. Type Ctrl+Tab or Ctrl+Enter to enter the character into the replacement field. When set to automatically check for updates, Scrivener will do so immediately when the program is opened, without needing a project open. Tooltips on Scrivener links now show the document's full binder path. The Script Settings dialog has been enlarged and made resizable to better accommodate Windows 10. The tutorial project has been updated and now includes a new "Quick Start" collection. Fixed a bug that allowed tables to be inserted into inspector comments and footnotes, which could cause Scrivener to crash. Fixed a bug causing the document templates folder assignment to switch to other items in the binder. Fixed a bug that incorrectly re-encoded Mac-created document and project reference links when the project was opened on Windows, breaking links that contained a space. Fixed a bug whereby newly added comments and footnotes were not included in project search until after reopening the project or running Save and Rebuild Search Indexes. Fixed a bug whereby Scrivener silently failed to open a project containing multiple .scrivx project files (as from a synchronisation glitch). Scrivener will open the project using the file that matches the project folder's name, or the most recent project file if none match. Fixed a bug whereby closing a collection could cause the editor to reload the binder selection rather than to continue displaying the item loaded from the collection. This also corrects a bug that caused multiple items loaded via a collection to revert to binder order in the editor when switching back to the binder. Fixed a bug that added an additional suffix each time an item was duplicated with a unique title; the appended integer is now incremented in each duplication (title��"1, title��"2, title��"3, etc.). Fixed a bug that caused header and footer text to switch to Courier New following multi-byte characters for some compile formats. Fixed a bug whereby Scrivener links to documents not included in the compile group were not removed when compiling to formats that convert the links to RTF bookmarks, resulting in broken links. Fixed a bug whereby Scrivener links were not removed when using File > Export, leaving broken links in the exported document. Fixed a bug whereby tables did not compile if they immediately followed a forced page break or were preceded only by blank lines. Fixed a bug that stripped character formatting when applying a paragraph-only formatting preset. Fixed a bug that could potentially allow the auto-update to run while a project was saving and might result in project corruption. Fixed a bug whereby newly created Scratch Pad notes sent to a project imported with their original title (e.g. "Untitled note") if the focus was not changed to another note and back before sending. Fixed a bug that placed documents in their creation order rather than binder order when using the Documents > Move > To menu command. Fixed a bug whereby items moved via the Move To command were placed at the top of the selected folder's contents rather than at the bottom, as is done when dragging and dropping onto the folder. Fixed a bug causing compile replacements with an empty "With" field to be ignored and deleted from the settings. Corrected the File > Export behaviour to keep document notes in RTF format when exporting the main text as FDX. Fixed plain-text compile to add fifteen empty lines between sections separated with a "page break" separator or with "page break before". Fixed a bug that caused some Mac-only auto-complete script settings to be lost if the settings were viewed on Windows. Fixed a bug that threw an error when using "Save As Template" from a project created from the "blank" template. Fixed a bug whereby auto-titling did not apply to documents with fewer than fifty characters or to documents titled "Untitled" (as might occur in a Mac-created template). Fixed a bug causing inspector comments and footnotes to always open expanded when switching documents or reopening the project. Fixed a bug whereby Mac compiled footnote numbers were lost after working in the project on Windows. Fixed a bug whereby Scrivener links could be pasted into the Scratch Pad, resulting in broken links (since Scrivener links apply only within the project). Fixed a bug whereby clicking a broken Scrivener link (as to a deleted document) brought up a prompt to search the Microsoft Store for an application to open the linked file. Fixed a bug causing the View Collections shortcut not to work when the main toolbar was hidden if the View > Collections menu had not previously been opened during the session. Fixed a re-introduced bug whereby selecting certain fonts such as Bookman Old Style from the format bar applied an unexpected variant of the font (e.g. Demi Bold vs. Light when there is no "Normal" variant). Fixed a bug whereby the alignment format controls did not properly update for centred text or immediately after applying a paragraph formatting preset that did not also apply font or font size. Fixed a bug whereby text linked to an inspector comment or footnote did not appear formatted as a link if the comments and footnotes could not load. Fixed a bug whereby inspector comments and footnotes were returned in when using Find by Formatting to search for for "All Links". Fixed a bug whereby the magnifying glass icon remained in the collection header after converting a search collection to a standard collection. Fixed a bug that misaligned collection titles in the binder header. Corrected several typos in translations.